That picture has nothing to do with my post. I just like it. I always thought this song was propaganda deployed by my Mother to get me to eat spinach. Then I got to the verse “Popeye the sailor man lives in the garbage can.” Wow, what’s up with that? I never thought about his super humble abode. I think the subliminal message communicated here does not match the intended propaganda. I can’t remember a time in which I wanted to live in a garbage can. As a matter of fact the only person I knew who lived in a garbage can was The Grouch over on Sesame Street. He was never happy, so I’m thinking living in a garbage can is less than ideal. Now I’m thinking this message may have been holding me back. Did my parents inadvertently set my career on a less than desirable path? Am I perchance sabotaging myself? Does anyone know a career positive song that might reprogram my garbage can size goals? The song from The Mary Tyler Moore Show??? But it’s funny – the picture. Thanks. I’ve listening to it now. Dee. And I thought it was a pretty good picture too. “Tomorrow” from Annie.. It pretty much says, ‘so what if you screwed up today, you’ll get another chance to do it again tomorrow’.. How uplifting is that? That’s the spirit.. Every silver lining has a dark cloud.. Exactly, if it works, I’ll let you know. Can’t think of a song–but I do remember that Oscar’s garbage can is actually amazing. It’s like the TARDIS or Mary Poppin’s carpet bag: bigger on the inside. Oscar’s pet elephant is in there, his ice rink, his farm . . . it’s gotta be awesome. There’s always this version, https://www.youtube.com/watch?time_continue=61&v=FvPs6A4eyBI, if you want your new aim in life to be “one tough gazookas”. “Let It Go!” from Disney movie, Frozen. Learn from the past, let it go and move forward, empowered to your shining destiny. But remember to stop for love. This is the song I’m thinking of, does it match yours? You want songs, I could give you a list… My favourite of course Imagine, John Lennon. He wants us to imagine the world as it could be. I Am Woman, Helen Reddy, I Will Survive, Gloria Gaynor of course there is always the great Aretha Franklin’s RESPECT… I could go on and on but that is a start. Sticking with TV shows, the theme from The Greatest American Hero ‘Believe It or Not’. You’ll be thinking you can do anything in no time at all, believe it or not! 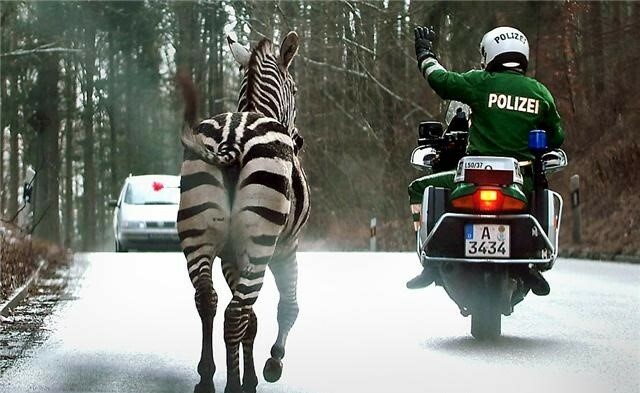 In the photo, to the left of the zebra, on the car windshield…is that your heart birthmark?